Investigation of solid phantom materials such as solid water, virtual water, plastic water, RW1, polystyrene, and polymethylmethacrylate (PMMA) for their equivalence to liquid water at 137 Cs energy (photon energy of 662 keV) under full scatter conditions is carried out using the EGSnrc Monte Carlo code system. Monte Carlo-based EGSnrc code system was used in the work to calculate distance-dependent phantom scatter corrections. The study also includes separation of primary and scattered dose components. Monte Carlo simulations are carried out using primary particle histories up to 5 Χ 10 9 to attain less than 0.3% statistical uncertainties in the estimation of dose. 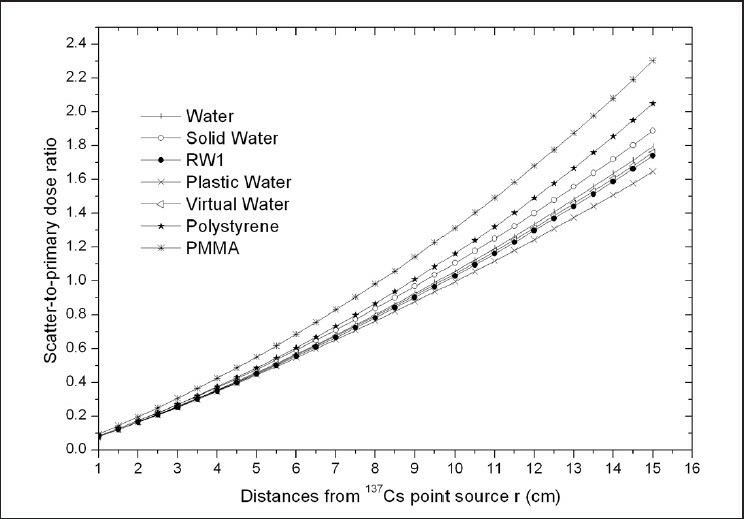 Water equivalence of various solid phantoms such as solid water, virtual water, RW1, PMMA, polystyrene, and plastic water materials are investigated at 137 Cs energy under full scatter conditions. The investigation reveals that solid water, virtual water, and RW1 phantoms are water equivalent up to 15 cm from the source. Phantom materials such as plastic water, PMMA, and polystyrene phantom materials are water equivalent up to 10 cm. At 15 cm from the source, the phantom scatter corrections are 1.035, 1.050, and 0.949 for the phantoms PMMA, plastic water, and polystyrene, respectively. Brachytherapy refers to a method of treatment in which sealed radioactive sources are used to deliver radiation at short distances by interstitial, intracavitary, or surface mould applications. Brachytherapy delivers a high dose in the tumor and an acceptable low dose to surrounding normal tissue due to rapid dose fall-off with distance. American Association of Physicists in Medicine (AAPM) Task Group reports, AAPM TG43  and TG43U1  recommend water as a reference medium for dosimetry of interstitial brachytherapy sources. Due to high dose gradients near brachytherapy sources and specification of the dose parameters within few centimetres of the source, source-detector distance should be specified very accurately for dosimetric measurements. Precise positioning of detectors, reproducibility of source and detectors in reference liquid water medium, and water proofing of detectors poses a practical problem. Solid phantom materials can be easily machined, to accommodate the source and detectors in a precise geometrical configuration, facilitating an accurate measurement and reproducibility in source-detector geometry. Suitable solid phantom material should be selected to mimic the absorption and scattering of radiation as that in liquid water. Constantinou et al.,  had studied the radiation characteristic of solid water, polystyrene, and lucite [polymethylmethacrylate (PMMA)] in the energy range 0.01-100 MeV for radiotherapy x-ray and gamma ray beam calibration and found that solid water is superior to the polystyrene and lucite phantom materials. Sahoo et al.,  investigated water equivalence of various solid phantom materials for 60 Co brachytherapy source using the Monte Carlo methods. The authors concluded that the phantom materials RW1 and solid water represent water equivalent up to 20 cm from the source. Whereas, PMMA and polystyrene are water equivalent up to 10 and 15 cm from the source, respectively. 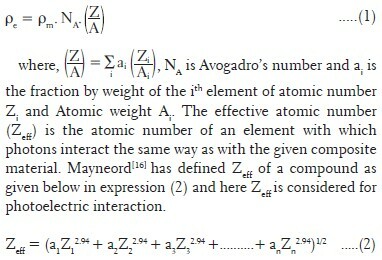 To our knowledge, limited information is available on phantom scatter corrections at the 137 Cs energy. The study by Pιrez-Calatyud et al.,  is only limited to comparison of Monte Carlo-based dose distributions in a PMMA phantom to thermoluminescent dosimeter TLD-based measurements in a PMMA phantom. Meigooni et al.,  studied the dosimetric properties of plastic water and solid water for photon energies in the range 20 keV- 60 Co including 662 keV using the Monte Carlo methods. The authors presented ratio of dose rate in medium to water only up to a distance of 5 cm for 662 keV photons. Where, a 1 , a 2 , a 3 , ....a n are the fractional contributions of each element to the total number of electrons in the mixture. Z 1 , Z 2 , ... Z n are the atomic number of each element. [Figure 1] shows the ratio of mass attenuation coefficient of solid phantom materials to that of liquid water, (μ/ρ) Phant /(μ/ρ) Wat as a function of photon energy, where the suffice "Phant" refers to phantom material other than water. 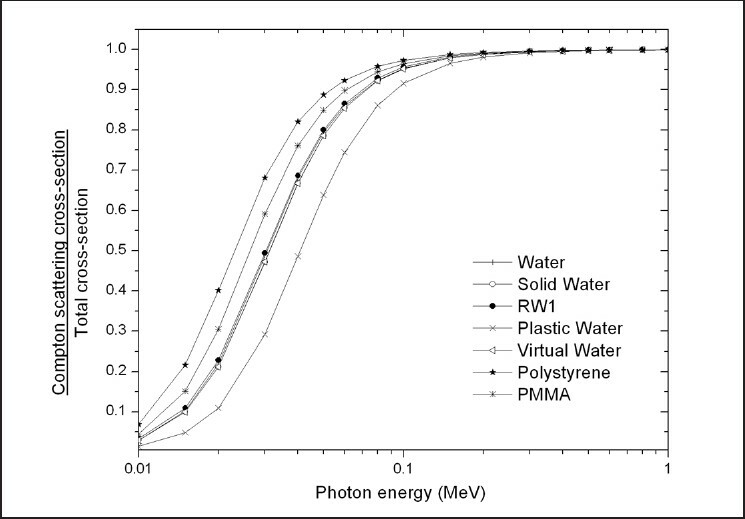 The values of mass attenuation coefficient of solid water, virtual water, and RW1 are comparable to that of water for photons in the energy range 15 keV-1.5 MeV (maximum deviation is less than about 3%). 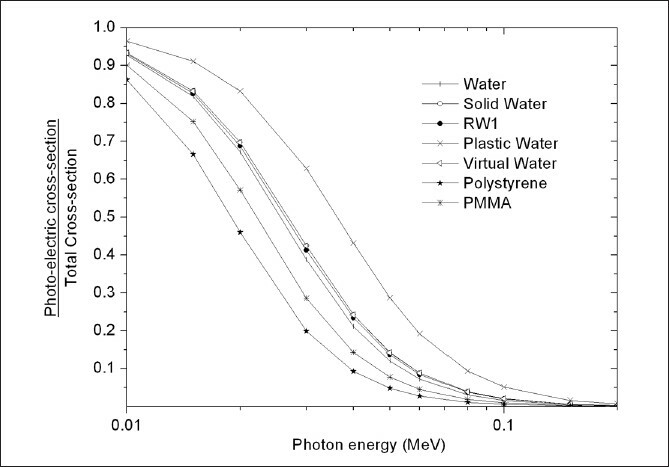 For PMMA and polystyrene, for photon energies less than 100 keV, (μ/ρ) Phant value is less compared with (μ/ρ) Water . For plastic water, the (μ/ρ) Phant value is significantly higher than that of water for photon energies below 100 keV. Above 100 keV, the (μ/ρ) Phant values of PMMA, polystyrene and plastic water are comparable within 3% when compared with that of liquid water. Contribution of photoelectric effect and Compton scattering (CS) to total mass attenuation coefficient was studied by using the state-of-the art XCOM  photon interaction data set. The ratio of photoelectric cross-section to the total cross-section of the phantom material (σPE, Phant /σTot,Phant ) is presented in [Figure 2]. 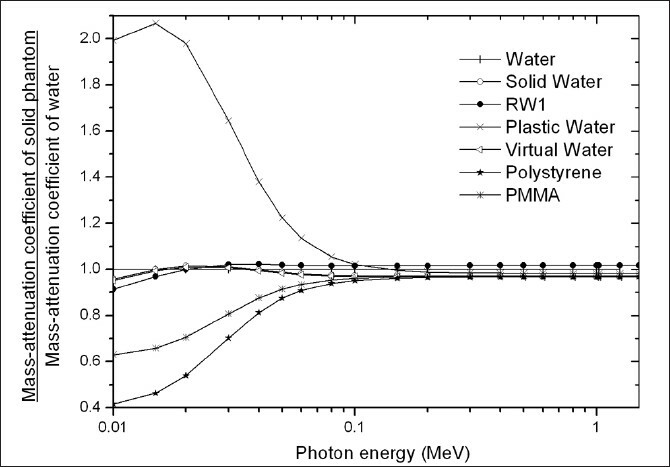 As seen from the figure, the ratio σPE,Phant /σTot,Phant for photons in the energy range 10-200 keV in solid water, virtual water, and RW1 is comparable to that of water. In phantom material having smaller Z eff such as polystyrene (Z eff = 5.70) and PMMA (Z eff = 6.47) as compared with water (Z eff = 7.42), the contribution of photoelectric effect to total interaction cross-section in material is less than that of water. Whereas, for the materials with Z eff values more than that of water, such as Plastic Water (Z eff = 9.37), larger contribution of photoelectric effect to the total cross-section of the phantom material is observed. The ratio of CS cross-section to the total cross-section of phantom material (σCS,Phant /σTot,Phant ) as a function of photon energy is shown in [Figure 3]. This ratio for Solid Water, Virtual Water and RW1 are comparable to that of water. 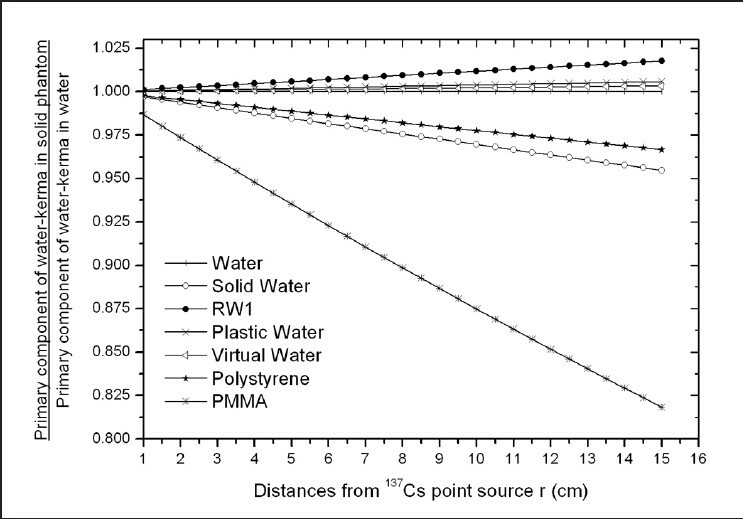 Polystyrene and PMMA show more contribution of CS to the total cross-section as compared to that of water. For plastic water, the contribution of CS to total cross-section is less than that of water for photon energies less than 200 keV. In the Monte Carlo calculations, the absorbed dose to water is scored for radial distances r = 1-15 cm in the liquid water and solid phantom materials in spherical shells of thickness 0.1 mm using the EGSnrcMP-based  EDKnrc  user code. In the case of solid phantom materials, the 0.1 mm thick spherical scoring region was filled with water. The radius of the material phantom is 50 cm, which provides full scatter up to 20 cm. This approach is based on the study of Granero et al.,  on the impact of phantom size and shape in brachytherapy dosimetry and Peérez-Calatayud et al.,  that a spherical phantom 40 cm in radius mimics an unbounded phantom for 137 Cs for full scatter conditions within 1% for distances less than 20 cm from the source. The density of water considered is 0.998 g/cm 3 at 22°C. For Monte Carlo calculations, we have considered only 662 keV gamma energy of 137 Cs emission (yield of 662 keV: 0.851 photon/disintegration. In the Monte Carlo calculations, we ignored x-rays from 137 Ba, as in a previously published study by Selvam et al.,  it was demonstrated that these x-rays were not important. The PEGS4 data set needed for the Monte Carlo calculations is based on widely used XCOM compilations. The low-energy threshold for the production of knock-on electrons (AE) is set to 521 keV for an electron with 10 keV kinetic energy, and the threshold for secondary bremsstrahlung photons (AP) is set to 10 keV. All Monte Carlo simulations utilized the PRESTA-II electron step length and EXACT boundary-crossing algorithms. The electron step size parameter, ESTEP is set to 0.25. To increase the speed of the calculations, for all simulations, electron range rejection technique is used by setting ESAVE = 2 MeV. The value of photon transport cutoff parameter PCUT used in all simulations is 10 keV. The value of ECUT used in EDKnrc and FLURZnrc calculations is 2 MeV. This means detailed electron transport is not necessary as water-kerma may be approximated to absorbed dose at 137 Cs energy. Up to 5 × 10 9 primary photon histories are simulated. The statistical uncertainties on the calculated estimates have a coverage factor k = 1. Uncertainties on the dose values from the EDKnrc simulations are less than 0.3%. [Table 3] compares dose rate per unit activity (cGy h -1 mCi -1 ) in liquid water phantom at 1 cm from the 137 Cs point isotropic source calculated in the present study against Melhus and Rivard. The dose rate values calculated by including Barium x-rays compare well. where, k is the unit conversion constant from MeV/g to J/kg, μphant (E) is the linear attenuation coefficient of the phantom material at photon energy E, and [μen /ρ(E)] w is mass-energy-absorption-coefficient of water at E. For 137 Cs source, E = 0.662 MeV. [Figure 4] presents the ratio of primary component of water-kerma in a solid phantom material to that in liquid water as a function of r from the 137 Cs point source (calculated using equation (3)). Deviation of this ratio from unity is due to differences in the values of linear attenuation coefficients of the phantom materials (difference is up to 18% at 15 cm for PMMA). The scatter component of the absorbed dose, D s (r) was obtained by subtracting D p (r) from the EDKnrc-calculated total dose. The scatter-to-primary ratio D s (r)/D p (r) helps in understanding the differences in the scattering of photons in different phantom materials. This ratio is plotted in [Figure 5] for the investigated phantom materials. Although the absolute values of D s (r) decrease with r, the ratio D s (r)/Dp (r) increases because of the inverse square fall of Dp (r). [Table 4] presents the distance at which Ds (r) equals Dp (r) for the investigated phantom materials. [Figure 6] presents dose per unit energy multiplied by 4πr2 per source photon as a function of r from the 137 Cs point source. [Table 5] presents the values of K(r) for select distances of r = 5 cm, 10 cm, and 15 cm from the source in solid phantom materials. The statistical uncertainty in the calculated phantom scatter corrections is less than 0.4%. 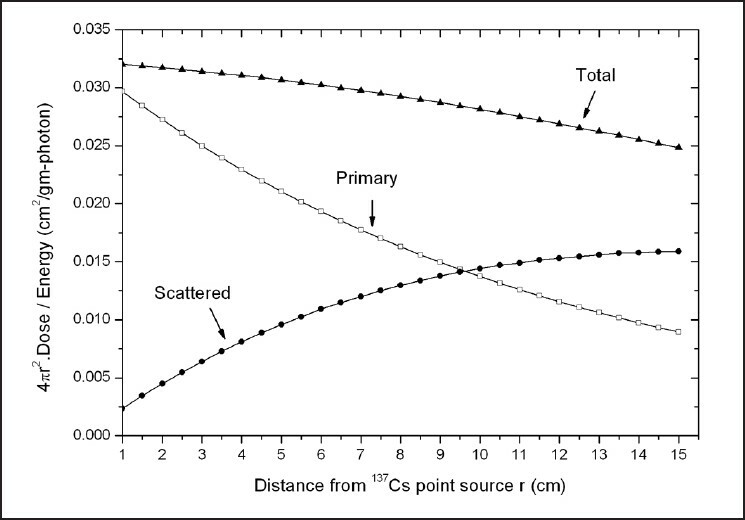 The values of K(r) calculated for PMMA phantom based on the point source compare within 0.5% with that of the 137 Cs RTR brachytherapy for distances up to 15 cm from the source. [Figure 7] represents phantom scatter correction K(r) for solid phantoms as a function of radial distance r from 137 Cs point source. At 5 cm from the source, all the investigated phantoms are water-equivalent. This observation is consistent with the study carried by Meigooni, et al.,  for the solid water and plastic water phantoms. Solid water, virtual water, and RW1 are suitable phantom materials for the dosimetry up to a distance of 15 cm from the source. Phantom materials such as plastic water, PMMA and polystyrene phantom materials are water-equivalent for distances up to 10 cm. At 15 cm, the phantom scatter corrections are 1.035, 1.050, and 0.949 for the phantoms PMMA, plastic water, and polystyrene, respectively. 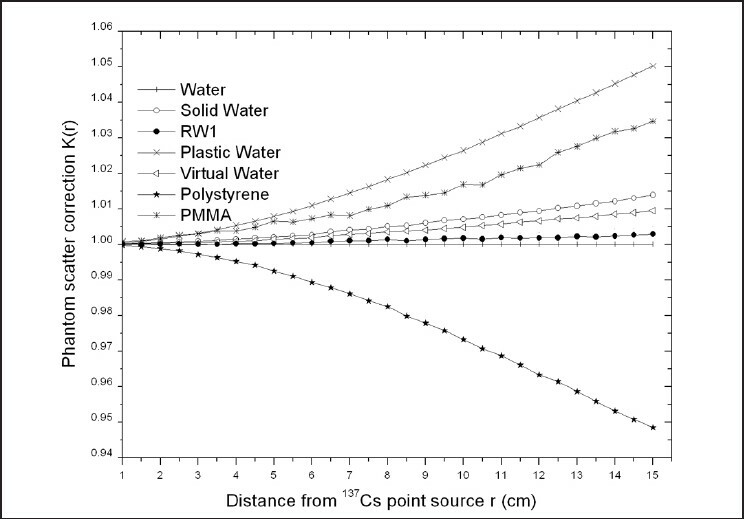 Water equivalence of solid phantoms such as solid water, virtual water, RW1, PMMA, polystyrene, and plastic water materials are investigated at 137 Cs energy for distances up to 15 cm from the source. The Monte Carlo-based investigation suggests that the phantom materials such as virtual water, RW1, and solid water are water equivalent up to 15 cm from the source. Polystyrene phantom demonstrates that the corrections are always smaller than unity and the deviation from unity is larger as the distance from the source increases. For example, the corrections at 10 and 15 cm for this phantom are about 2.5% and 5% smaller than unity, respectively. For PMMA phantom the phantom scatter correction is less 1% for distances up to 8 cm and it increases to about 3.4% at 15 cm. The corrections for the plastic phantom are about 2.5% and 5% larger than unity at distances 10 and 15 cm, respectively. The corrections obtained for the phantoms virtual water and solid water are comparable at all distances. The investigation demonstrates the importance of evaluation of water equivalence of a solid phantom material prior to its use in dosimetric measurements. 1. Nath R, Anderson LL, Luxton G, Weaver KA, Williamson JF, Meigooni AS. Dosimetry of interstitial brachytherapy sources: Recommendations of the AAPM Radiation Therapy Committee Task Group No. 43. American Association of Physicists in Medicine. Med Phys 1995;22:209-34. 2. Rivard MJ, Coursey BM, DeWerd LA, Hanson WF, Huq MS, Ibbott GS, et al. Update of AAPM Task Group No. 43 Report: A revised AAPM protocol for brachytherapy dose calculations. Med Phys 2004;31:633-74. 3. International Commission on Radiation Units and Measurements (ICRU) Report 44: Tissue substitutes in radiation dosimetry and measurement; 1989. 4. Constantinou C, Attix FH, Paliwal BR. A Solid water phantom material for radiotherapy x-ray and γ-ray beam calibrations. Med Phys 1982;9:436-41. 5. Sahoo S, Selvam TP, Vishwakarma RS, Chourasiya G. Monte Carlo modeling of 60 Co HDR brachytherapy source in water and in different solid phantom materials. J Med Phys 2010;35:15-22. 6. Meli JA, Meigooni AS, Nath R. On the choice of phantom materials for the dosimetry of 192 Ir source. Int J Radiat Oncol Biol Phys 1988;14:587-94. 7. Carlsson Tedgren A, Carlsson GA. Influence of phantom material and dimensions on experimental 192 Ir dosimetry. Med Phys 2009;36:2228-35. 8. Meigooni AS, Meli JA, Nath R. A comparison of solid phantoms with water for dosimetry of 125 I brachytherapy sources. Med Phys 1988;15:695-701. 9. Meigooni AS, Awan SB, Thompson NS, Dini SA. Updated Solid Water TM to water conversion factors for 125 I and 103 Pd brachytherapy sources. Med Phys 2006;33:3988-92. 10. Luxton G. Comparison of radiation dosimetry in water and in solid phantom materials for I-125 and Pd-103 brachytherapy sources: EGS4 Monte Carlo study. Med Phys 1994;21:631-41. 11. Reniers B, Verhaegen F, Vynckier S. The radial dose function of low-energy brachytherapy seed in different solid phantoms: Comparison between calculations with EGSnrc and MCNP4C Monte Carlo codes and measurements. Phys Med Biol 2004;49:1569-82. 12. Pérez-Calatayud J, Granero D, Casal E, Ballester F, Puchades V. Monte Carlo and experimental derivation of TG43 dosimetric parameters for CSM-type Cs-137 sources. Med Phys 2005;32:28-36. 13. Meigooni AS, Li Z, Mishra V, Williamson JF. A comparative study of dosimetric properties of Plastic Water and Solid Water in brachytherapy applications. Med Phys 1994;21:1983-7. 14. Kawrakow I, Rogers DWO. The EGSnrc Code System, Monte Carlo simulation of electron and photon transport. Technical Report No. PIRS-701, National Research Council of Canada, Ottawa, Canada 2006. Available from: http://nparc.cisti-icist.nrc-cnrc.gc.ca/npsi/ctrl?action=shwart&index=an&req=8898781〈=en (Last accessed date on 01-08-2013. 15. Shrimpton PC. Electron density values of various human tissues: In vitro Compton scatter measurements and calculated ranges. Phys Med Biol 1981;26:907-11. 16. Mayneord WV. The significance of roentgen. Acta Int Union Against Cancer 1937;2:271. 17. Hubbell JH, Seltzer SM. Tables of x-ray mass attenuation coefficients and mass energy-absorption coefficients, National Institute of Standards and Technology, Gaithersburg, MD;1995. Available from: http://www.nist.gov/pml/data/xraycoef/ [Last accessed date on 01-08-2013]. 18. Berger MJ, Hubbell JH, Seltzer SM, Chang J, Coursey JS, Sukumar R, et al. XCOM: Photon Cross Sections Database, National Institute of Standards and Technology; XCOM v3.1; Available from: http://www.nist.gov/pml/data/xcom/index.cfm [Last access date on 01-08-2013]. 19. Rogers DWO, Kawrakow I, Seuntjens JP, Walters BRB. NRC User Codes for EGSnrc. Technical Report No. PIRS-702, National Research Council of Canada, Ottawa, Canada, 2006. Available from: http://nparc.cisti-icist.nrc-cnrc.gc.ca/npsi/ctrl?action=shwart&index=an&req=8898504〈=en [Last accessed date on 01-08-2013]. 20. Granero D, Pérez-Calatayud J, Pujades-Claumarchirant MC, Ballester F, Melhus CS, Rivard MJ. Equivalent phantom sizes and shapes for brachytherapy dosimetric studies of 192 Ir and 137 Cs. Med Phys 2008;35:4872-7. 21. Pérez-Calatayud J, Granero D, Ballester F. Phantom size in brachytherapy source dosimetric studies. Med Phys 2004;31:2075-81. 22. NUDAT 2.6, National Nuclear Data Center, Brookhaven National Laboratory, Available from: http://www.nndc.bnl.gov/nudat2/index.jsp [Last accessed date on 01-08-2013]. 23. Selvam TP, Rajan KN, Nagarajan PS, Bhatt BC, Sethulakshmi P. Room scatter studies in the air kerma strength standardization of the Amersham CDCS-J-type 137 Cs source: A Monte Carlo study. Phys Med Biol 2002;47:N113-9. 24. Pérez-Calatayud J, Granero D, Ballester F, Casal E, Cases R, Agramunt S. Technical note: Monte Carlo derivation of TG-43 dosimetric parameters for radiation therapy resources and 3M Cs-137 sources. Med Phys 2005;32:2464-70. 25. Melhus CS, Rivard MJ. Appraches to calculating AAPM TG-43 brachytherapy dosimetry parameters for 137 Cs, 125 I, 192 Ir, 103 Pd, and 169 Yb sources. Med Phys 2006;33:1729-37.